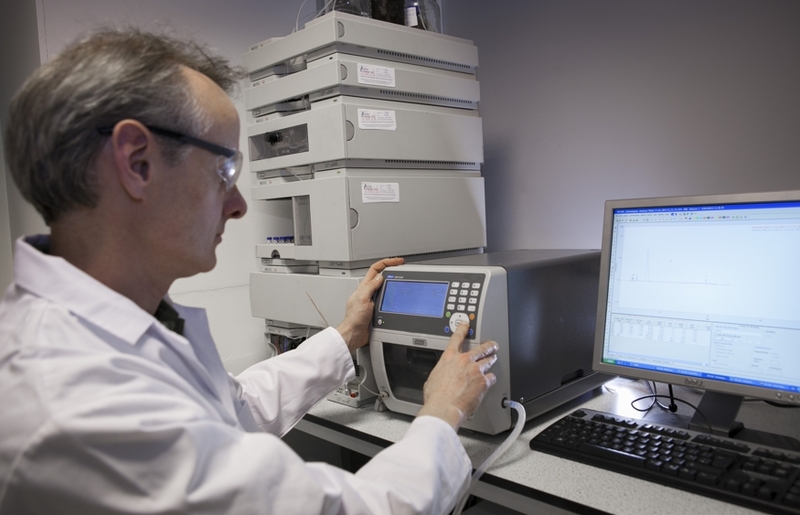 High Performance Liquid Chromatography (HPLC) is a flexible technique that allows separation and quantification of chemical substances found within a complex mixture. For example it can be used for quantification of sugars produced during biomass processing or for the determination of valuable chemical components in process streams or feedstocks. HPLC – involves injection of a liquid sample, containing the chemical(s) of interest, being injected onto a chromatographic column. The sample is transported through the column by the flow of inert, liquid mobile phase. The column itself contains a solid stationary phase, through which the liquid flows. The chemicals being analysed interact with stationary phase, with each chemical travelling through the column in a different times – this is known as the retention time. The analytical value of HPLC is based on the comparison of retention times. To learn more about how our high performance liquid chromatograph can be put to use speak to our analytical specialist Raymond. The gas chromatograph at the BDC is a HP1100 series, equipped with a 100-sample autosampler, quad-pump and both diode array (DAD) and evaporating light scattering (ELSD) detectors. The DAD allows detection of many organic compounds, which can absorb ultraviolet or visible light The ELSD is suitable for detection of compounds, which do not absorb light (e.g. sugars and lipids). Electronic data capture and analysis is performed using DataApex Clarity software.